Cheap living on a sailboat is a misnomer...there just aren't that many opportunities to spend. Let me explain we spent 8 years living on a 35 foot Island Packet, Shadowtime. 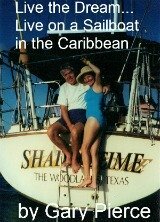 We sailed back and forth from The Virgin Islands down the Windward's and Leeward's to Trinidad and Venezuela. Our average monthly expenses were $1,000 for the time we were on the boat. We lived like a king and queen. No rent...by anchoring out, free, you have no cost for your accomodations. We would sometimes chuckle having a sundown cocktail. We would be anchored 100 yards from the dock at a Rock Resort...their guests were paying $500 a night...we had a better view! Call me sadistic, we used to love to go ashore, regale the resort guests with our lifestyle on her own boat... Knowing that they would be back in the rat race the next week. We might not leave the resort anchorage for two weeks... Forgive me Lord. Think how much money you spend operating your car(s) every month. 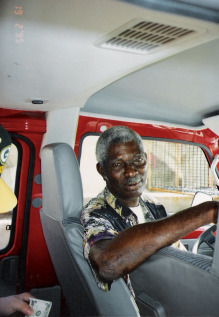 We walked, got good exercise, or took the bus or maxi-taxi...the fare, $0.07 to a dollar. We had no maintenance costs, no cost for gas or oil, no parking charges, no car insurance,...ah, cheap living on a sailboat. When you are in a rental car. How many locals do you meet?...answer none. Cheap living on a sailboat has a lot of advantages besides being frugal. Without fail when you were anyone else got on the bus a good morning or good afternoon was mandatory... The island people are a little on the shy side, but they are unfailingly polite... And there is nothing wrong with that. When you are in the Caribbean you need a very limited wardrobe...swim trunks and a t-shirt for the guys, swimsuit and coverup for the ladies. We both wore hats, sunglasses (tied around your neck) and waterproof sandals, that was it. For the rare night ashore or church a collared shirt (I think I had two on board) and a cotton dress were all you need. In fact when we flew to the boat in the late fall we carried everything we needed for the season in our back packs...no checked bags. 95% of all our meals were had on board or on someone elses boat...cruisers stick together. When we did go out it was usually for lunch. If you follow the 2 criteria we had, you would always be assured of a great, fresh and cheap meal. You ate at a local restaurant, that made it cheap...and you knew the food was fresh if it was on chalk. If anyone handed you a menu...you would run. These two rules never failed us. For lunch with a few adult beverages, after tip, we would expect change in our pocket for a ten dollar bill...a lot of change in Venezuela. Cheap living on a sailboat means not a lot of mingling with visitors on a weeks vacation or on a cruise ship. Think about it...they are in the resort (paying $500 a night)or in their rental car. They are dressed up in golf shirts and tennis outfits. They think they are really island living, but it is far from it. You may encounter a few of them if they are really slumming and find a bar you frequent. They are usually blown away when you tell them you are living on a sailboat. They sometimes look at you like you are from Mars. Rarely we would have a tourist couple out to the boat. They expected Robin Leach to pop out of the galley with a camera...but life in the islands on a boat and the islands tourists see are vastly different. Cheap living on a sailboat is a lifestyle that is right for some of you. It is really not an unattainable dream. We are living proof of that. We would not exchange those eight years for anything...are you ready to go?